The Jerusalem Quartet offer masterfully controlled and impressively dynamic accounts of the String Quartets by Claude Debussy and Maurice Ravel. A century after his death on 25 March 1918, many harmonia mundi artists are eager to pay tribute to Claude Debussy, the magician of melody and timbre, the great ‘colourist’ and father of modern music. 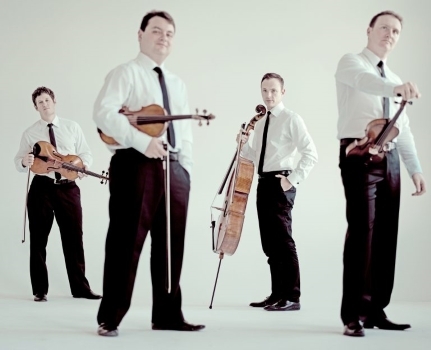 The musicians of the Jerusalem Quartet offer a new reading of his only String Quartet, in the logical coupling with its Ravelian counterpart: in some respects, the two works might seem like twins – and yet what differences there are between them! In advance, I wondered whether there was anything new to be said about these two incessantly recorded works. Happily the answer is 'yes'. Nor is it due to anything imposed - the novelty comes quite simply from doing what it says on the tin. This disc is a superb combination of intelligence, honesty, taste and technique. It’s a strikingly intense performance, grand in scale, emotionally heated and dark in tone…the richness and weight of the Jerusalem Quartet’s sound spreads a pall of sensuality over the whole work, and the sweep and urgency of the phrasing create a heady immediacy throughout…It’s a fine performance, beautifully articulated and superbly played, but ultimately it’s the Debussy that is the disc’s raison d’être. It’s quite remarkable: do listen to it. As you would expect from such a seasoned group, their mastery of rubato is impressive. They move as one, and yet there is space for individual instruments to rise out of the texture when appropriate...Their group playing is spellbinding, drawing you in because of how quiet it is.